The medium of photography, and video art in its wake, is immediately associated with the autobiographical, once for its documentary-indexical aspect – the possibility of capturing and perceiving reality and again of its iconic aspect – the way in which each photographed image becomes a memory of what has been. The duality of the real versus the imaginary and fictional inherent to photography is entailed with the autobiographical from the movement between the past and the present, between private and collective events and rituals, between personal histories and memories and iconic events, and between linguistic and textual images and visual images. In the three exhibitions presented in the 8th season of Photopoetics, we will set out to explore the different ways in which identities and autobiographical voices are shaped in the meeting of photography, video, and writing. They will explore introspection as a means of unfolding hybridized, fluid, and multicultural worlds and freedom of thought formed by the revealing gaze turned inwards. They will center on questions of aesthetics and intrinsic grammar, of self-definition and awareness, of fragmentation and of existential options that also hold movement and individualism. The exhibitions will unfold documentary spaces and offer a critical perspective on identity as a body, as a language, as a tapestry of affinities and interactions, exploring themes such as humanism, female identity, Mediterranean culture, memory and myth, and familial relationships. Alongside these, they will also introduce issues of photography and video through the lens of the discourse surrounding modernism and postmodernism at this point in time and the possibility of formulating their connection to autobiographical writing and the construction of new narratives. As in its previous iterations, Photopoetics 8 takes place in Musrara’s three galleries and focuses on the meeting of photography, video, and poetry. This time, it brings together works by women artists, photographers, poets, writers, and curators. The project creates a space for discussion and contemplation of questions concerning the relationship and tension between the written word and the visual image. And like each year, the exhibitions will be accompanied by a series of events that combine music and poetry reading. 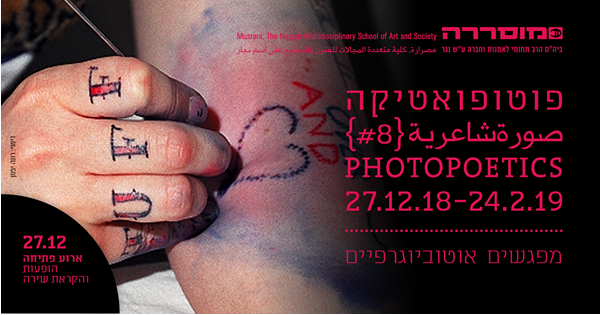 Artists: Hadeel Abu Johar, Ilit Azoulay, Sagie Azoulay, Mati Elmaliach, Rafael Balulu, Adi Brande, Dor Gues, Chen Cohen, Michal Heiman, Vered Nissim, Dafna Sahlom.